This device helps develop the ability to use your arms in a confined space, by keeping your elbows on the centerline. It teaches the user to keep the arms chambered, the body and horse straight and supportive, the stance spaced properly and the footwork strong yet swift. Helps keep the hands drawn with the elbows in while executing a hand maneuvers. Use of the rattan ring teaches the use of the power that comes up from beneath the elbows, and teaches the practitioner to fight when there is a constant force on the bridges such as occurs in actual combat. 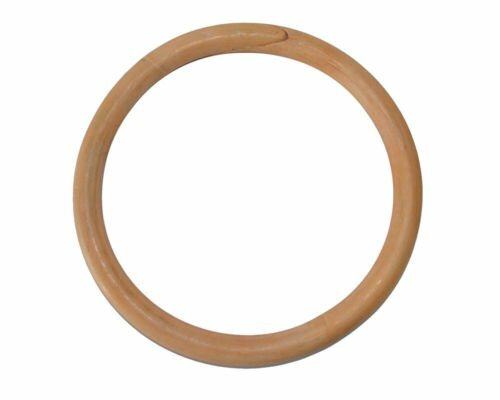 Use of the bamboo/rattan ring will build relaxed power, instill proper fighting posture, and permit the proper execution of speed and Jing (power). It is also very effective at teaching the skill of feeling or sensitivity, an essential part of Chi Sao. Smaller rings are for more close in, elbows in training which relates most to close in fighting and grappling. The Taan Hiun as it is called in Cantonese is typically associated with the Wing Chun Kung Fu system but is in fact one of the Jongs, or wooden training aids inherited from the Shaolin Temple. It's use can be seen in a variety of Southern Kung Fu systems particularly those linked to the Hakka people, which tend to focus on short distance fighting and centerline control. It use is more often seen in the Wing Chun system but this device is also used other styles such as Chow Gar, Bak Mei, Bak Hok Pai and others. Its use will benefit practitioners of any style of martial art. Size : inside diameter 6.9"
Excellent item for Wing Chun training,help teach the practitioner to keep their hands properly linked in attacks and defense.Also helps toughen the forearms. If you have any questions about this product by Hotour, contact us by completing and submitting the form below. If you are looking for a specif part number, please include it with your message.